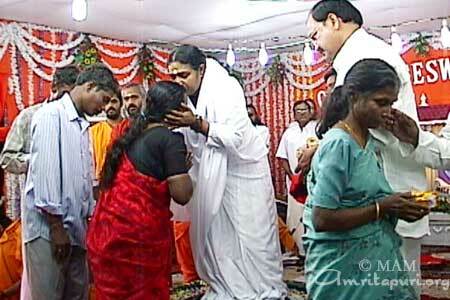 At 8:30 a.m., Amma returned to Amritapuri in a little boat over the backwaters. She came from Kodungallur where the last programme of her three-week tour of southern India had finished at 4:00 a.m. When she arrived the first thing she did was to visit Ram, the baby elephant. She went into his stable and gave him a bath. As Amma hosed him with water, he raised his trunk in delight and came close to her several times, fondling the curve of her face with the end of his trunk, like a baby kissing its Mother. Amma received her son’s affections joyously and continued to bathe him. He sat down, clearly enjoying his ducking beneath the spray from his Mother and rolled over to let his attendants scrub his body and clean the lips of his mouth. Just like a baby’s bath-time, parents and children were having a lovely time, and nobody wanted to leave. Finally Amma stopped the hose and, calling his name, said her goodbyes. As she walked to her quarters somebody handed her a tiny homeless baby bird. She cupped it in her hands and kissed it. Devotees pressed her on every side, and Amma kept the bird carefully in her hand as she walked, letting her divine glances fall on the faces of everyone. She walked up the steps to her room, the bird still clasped gently to her bosom, and, kissing it once more, she waved affectionately to her children below the stairs and went inside. 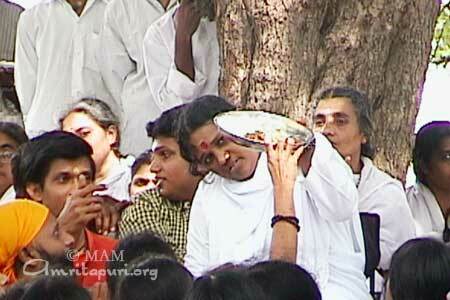 Amma was giving darshan in Kodungallur, Kerala when one of the worst earthquakes in Indian history hit Bhuj, Gujarat. It measured 6.9 on the Richter Scale. The initial reports were bad—buildings were rubble, entire villages had been razed, and the injured and the dead were uncountable. 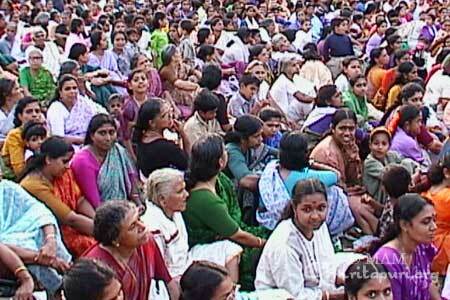 Amma asked the Kodungallur devotees to pray. Amma’s immediate response was to send a 12-person medical team from AIMS, M.A. Math’s Super Specialty Hospital, along with two fully equipped ambulances to the region. The team comprised one general surgeon, two neurosurgeons, an orthopaediatrician, two anaesthesiologists and a paediatrician. There were also three nurses, a biomedical engineer and four ambulance drivers. The ambulances supported inbuilt operation theaters and were stocked with Rs. 2,000,000-worth of medicine as well as an equal amount of surgical equipment. Amma also made arrangements for around 100 student and staff volunteers from various Amrita institutions to participate in the relief efforts. The conditions were tough – bitter cold, Spartan facilities, lack of proper food, and utter confusion prevailing in the town. Regardless, the student volunteers rose to the occasion, cooking food and serving food, distributing water sachets supplied by well-wishers and devotees, clearing debris so that ambulances could ply the route, promoting general sanitation. They also assisted the doctors in shifting patients in stretchers, sorting the medicines, and consoling the people. All in all, the team visited 25 villages, distributing food articles, water and clothes, and providing medical care. After two days, they started concentrating on five villages, namely Kokera, Dagara, Mokhana, Modsar and Jawar Nagar. In most of these villages, there were Hindus as well as Muslims. The people of this small town four hours’ drive from Amritapuri have had years of experience with Mother’s visits – and their enthusiasm seems only to grow, as the crowds get bigger and more eager. Every day this year, during Amma’s darshan, the line of women, clad in colorful saris, stretched at least a kilometer from the ashram grounds. 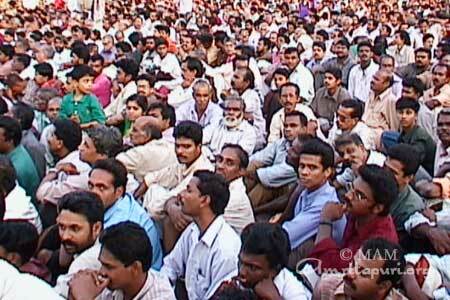 At the other side of the ashram premises a line of men had formed, stretching equally far. This was the scene during all three days of the programme: huge crowds, darshan from noon until at least five, an evening programme at seven-thirty, and darshan until four in the morning. When the last darshan was finished and Mother rose to bid her children farewell, she looked out over a sea of loving faces and reaching arms. “Om Amriteshwaryai Namaha,” the devotees were chanting, the same words with which they had greeted her arrival. When the devastating earthquake struck, Amma was in Kodungallur, Kerala. Amma’s heart went out to the victims, and she urged her devotees gathered at the programme, numbering over ten thousand, to offer special prayers for the earthquake victims. Amme e jeevanu mukti nalkan, ……..
[Oh, Mother of the Universe, there is no one other than You who can wipe the tears off this face, who can liberate this soul]. 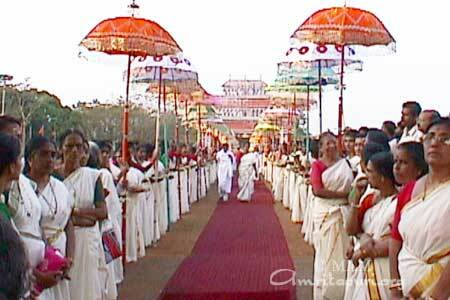 All the splendour India is capable of was in evidence during Amma’s recent one-night programme in Trissur on 25th January, 2001. 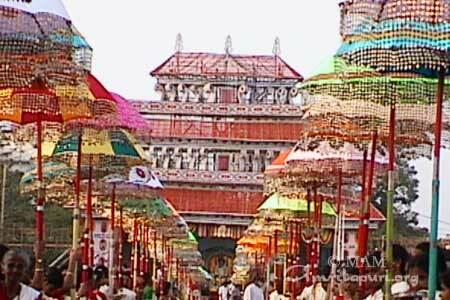 It was Her first visit to this town in three years, and the enthusiasm of the devotees was overwhelming. The whole city seemed decked out to welcome Amma. There were banners, stickers, and long strands of banana leaf streamers hung across and along the streets. A gigantic cut-out of Amma towered over the open field that had been turned into the programme site, and strings of flashing lights lined the walkways and boundaries. A hundred-meter aisle led to a pandal – designed to resemble the dignified stone temples – which was bounded by statuettes of meditating Buddhas. Women stood on both sides of the aisle holding trays of grains, oil lamps and flower petals. High above them fluttered ceremonial parasols in brilliant colours. Standing at the foot of the aisle in welcome were three elephants, regal in golden head dress, their mahouts seated on top of them. A large photo of Mother’s compassionately smiling face graced the head of the elephant in the centre. The smallest of the elephants was adorable, and was even smaller than Ram, the elephant staying in Amritapuri. Yet another spectacle was the dancers. On their shoulders, they carried towering structures resembling the traditional trapezoidal temples of South India, balancing them with grace while spinning and moving up and down. At about 6:15 in the evening, Mother arrived. A conch sounded, and temple musicians welcomed her enthusiastically. Smiling at the exuberant devotees who had rushed to the aisle to catch a glimpse of Her, Amma mounted the stage, prostrated to the devotees, and began the programme of satsang, bhajan, meditation and darshan. There was a crowd of over fifty thousand, prompting the local Member of the Legislative Assembly, Mr. T. Ramakrishnan, to remark that the programme was like a mini Kumbha Mela. By the time Amma had finished giving darshan, it was past seven the next morning. As She walked down the aisle towards Her car, she looked around at Her children, checking to see if everyone had received darshan. So ended this year’s Trissur programme – too short for the devotees, but eventful nonetheless. As soon as the Devi Bhava ended, the devotees had rushed to form a pathway for Amma to walk the short distance between the stage and Her car, hoping to catch that last glimpse of Her. Everyone was waiting in silent anticipation, except a young child, whose loud crying filled the air. This child’s parents were trying everything they could to pacify their child, but nothing worked. Finally, Amma appeared and began to stroll through the pathway. She walked right up to where the child was crying, took it in Her arms, and the crying stopped instantly! The crowd was so struck by this scene that everyone began to applaud and laugh simultaneously! After a few moments, when Amma returned the baby to its parents, it started bawling again immediately, much to everyone’s amusement. The child sure knew what it wanted! During the Chennai Brahmasthanam Festival keys were distributed to recipients of Amrita Kuteeram, Mother’s house-building project for the homeless. The Union Minister for Rural Development, Sri Venkaiah Naidu, handed over the keys in the presence of Amma. Speaking on the occasion, he said: “I am not a spiritual man. I am an ordinary person, but I can tell you that I am really mesmerised, thrilled, and inspired by the service Amma is doing for the people. I can say that she is doing more than I am doing as a government Minister, and more such activities are forthcoming that will be really useful in answer to the people’s problems. Madurai is famous for an exquisitely designed, sculpture-covered, dramatically high-rising (in the traditional Tamil Nadu style) Meenakshi Temple. The Devi there is clad in green, and whenever Mother is in Madurai, this Devi is honoured on the night of Her final programs. First, when the four-sided murthi (holy image) in the Brahmasthanam temple at the ashram is decorated for the Shani Puja, the face depicting Devi is always dressed in green, and her crown is a replica of the crown of the Meenakshi Devi. (In fact, when Mother installed this temple in 1995, the Meenakshi Temple sent their Devi’s crown itself to grace this side of the murthi). After the puja, Mother begins Devi Bhava-and though in other parts of the world She might be clad in red or gold or cream or white or blue-in Madurai, it is always green. 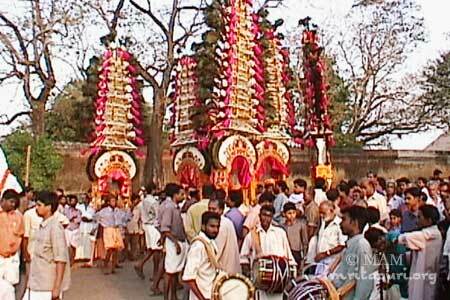 In this way, Mother is honouring the local people’s devotion to Meenakshi. One must be a Hindu to enter the Meenakshi Temple. This year many of Mother’s western devotees who are following the tour wanted to visit the temple; those who have adopted Hinduism as their path dressed in conservative Indian clothing, wore traditional marks of vibhuti or kumkum on their foreheads, and were escorted into the premises by an Indian devotee. It was an unusual and impressive experience for Mother’s children, to enter this venerable edifice. At a roadside lunch stop, Mother, sitting surrounded by all the Indian and foreign devotees travelling with Her, looked out over the crowd and asked: “Meenakshi?” At first, no one seemed to understand. She continued, “Temple going?” “Yes, yes,” came the enthusiastic responses of those who had visited the temple. “Very nice building,” Mother offered. A voice from the back of the crowd said, “Yes, but Meenakshi was giving darshan back at the ashram!” And everyone laughed. Some reflected, and felt blessed. Amma departed from Madurai immediately after Devi Bhava darshan at about 8:00 a.m. A long day of travelling was to follow for the long caravan of ashram buses and vehicles. Yet the magic of travelling with Amma is not so much the moving, as it is the stopping. All of the ashramites were blessed with the first such stop at lunchtime under the veranda of a small roadside temple. Many of the ashramites have their names painted on their plates, so as not to lose them. As Amma passed the plates, she kept stopping to read the names, both Indian and Western, to everyone’s delight. “Eckhard, Melissa, Paul, Amma’s Jani…,” she called out. But as soon as someone asked Amma how she could read the Western names printed in Roman letters (being only familiar with the Malayalam script), Amma suddenly stopped. There was a mischievous smile on her face. But she kept serving the food. Several hours later the ashram road train pulled over again as the sun was setting. 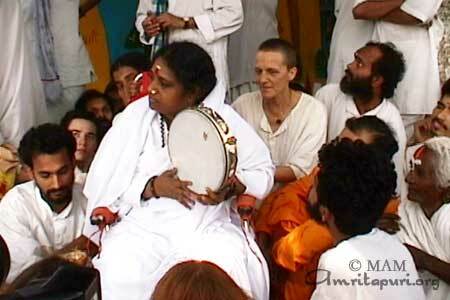 This time in a more serious mood, Amma began to ask questions and a satsang developed. 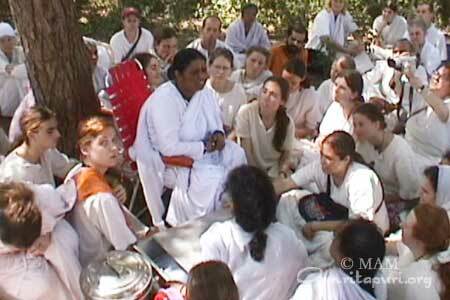 Amma explained the importance of sincerity in our spiritual practices. She said that often we may feel dejected because it seems that no progress is being made. She asked us to think about how often we are introspective and take time to examine how much progress we have really made, to see how much we have changed since we came to spirituality. Amma then told a story from the Ramayana. As the satsang ended the sun had nearly set and Amma and all her children welcomed the night sky by joyously singing bhajans. Finally after a quick dinner all climbed back aboard the buses to finish the journey to Chennai. Like all other days travelling with Amma, this was one to remember. Chennai (Madras), one of the cinema capitals of India, has large cut-out photographs of film stars. A centre of political activity, it sports larger-than-life cut-outs of political leaders, too. Among the cut-outs towering above the crowded streets of Chennai, this year there were those of Amma – the one at the entrance to the Ashram showed Amma holding her hands above her head as in prayer, in the humble greeting one makes to God. It is the very same gesture Mother makes whenever she steps onto a stage and greets the crowds: She raises her hands in this prayer, and then humbly prostrates to the Divine in each of her children. Mother was greeted by enthusiastic crowds upon her arrival at her Chennai Ashram, where she would hold a four-day Brahmasthanam programme. Early the next morning, after three archanas [traditional chanting of the Divine Mother’s thousand names], she arrived at the stage for bhajans, satsang, meditation, and darshan. This is the pattern at Amma’s Brahmasthanam Festivals – the morning programme with darshan running until late in the afternoon, then more archanas and an evening programme, with darshan sometimes lasting until nearly dawn, when the cleaning and setting up for archana begins. Sri Venkaiah Naidu, the Union Minister for Rural Development, who had flown in from New Delhi, received the keys from Amma and handed them over to the fortunate individuals who would be moving from hovels (if any shelter at all) into the simple but adequate homes that Amma’s “Homes for the Poor” programme is providing all over India. The audience cheered as each recipient approached Mother for her blessing, and then Sri Venkaiah Naidu, who handed them their keys to their new homes- their new lives. There were elderly women, bent old men, a young mother with her child, a blind man, and a man so crippled that a friend had to carry him to Mother to receive her embrace. Even for people familiar with Amma’s project that provides housing for the destitute, there is nothing to compare with seeing the very individuals whose lives are so touched – seeing their reverence, love and gratitude for she who is giving them such hope. One woman prostrated so long at Mother’s feet in her thankfulness that someone had to help her rise. These are the humans behind the statistics; in their presence, our hearts naturally open.